Owner, John Maloney, built his 5 STAR top rated concrete staining coating company on two simple principles: Quality and Service. 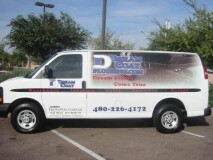 For more than 15 years, John and the Dreamcoat Flooring staff have been dedicated to serving the Phoenix metro area with superior quality concrete flooring solutions (See dozens of customer reviews here!) and unparalleled customer service. Over this time, a large part of our business has been repeat customers, and we firmly believe this is because of our commitment to building lasting partnerships with our clients, working together to achieve the floor of your dreams. Initial NO cost, NO obligation survey of your space complete with estimate of project costs. We are confident in our craft and believe we can help you with all your concrete coating needs, from residential to commercial projects. We believe our superior workmanship and quality service speak for us, and are happy to provide examples of our work and references. Also, please review our Epoxy Flooring FAQ page to hear answers to the top 6 questions we hear about epoxy flooring so you can prepare yourself in advance with education! Our concrete flooring solutions are known for their reliability, durability and the beauty that they can bring to any space, large or small. We take great pride in the work we do, and we want you to love your concrete flooring as much as we do. We only use the highest quality, industrial-grade materials and perform precise installation techniques in all of our projects, from residential garages to commercial showrooms and airport hangars. 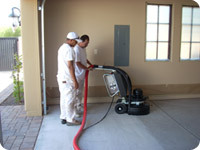 As your concrete coating contractor, our highly trained technicians will work efficiently to complete your project on time and on budget, without cutting corners. We understand how busy life can be, and the last thing we want you to worry about is the concrete that you are working, playing and living on. You can be sure your new concrete flooring will last for years to come with the installation of our high quality durable concrete coatings, which include: epoxies, polyurethanes,polyureas, acrylics and more. We are confident that we can offer you the most durable and reliable concrete coating and treatment solutions that will meet your specific residential or commercial needs at a budget friendly price. We are available from 7am - 6pm, Monday through Friday. For your convenience, we are even open from 8am - 3pm on Saturdays. Contact us online, or Call: 480-226-4172 for more information, or to schedule your no cost, no obligation consultation!